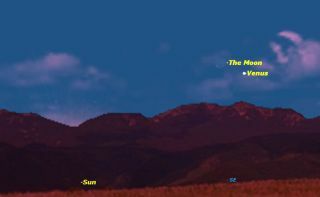 At sunrise on Thursday January 10, this will be the naked-eye view of the moon and Venus, low in the southeastern sky. Early-bird stargazers will have rise early Thursday (Jan. 10) to catch sight of the two brightest objects in the night sky — Venus and the moon — engaged in a final pre-dawn dance. To catch the celestial sight, set your alarm clock to ring one hour before sunrise, then quickly head outside. Make sure you go to a viewing site where your east-southeast sky is free of any obstructions such as buildings or trees, since what you’re attempting to see will be poised low above the horizon. You’ll be looking for the brilliant planet Venus, and hovering only just above and to its left will be a hairline crescent moon, just 2-percent illuminated and about 32 hours before reaching its new phase. Since the moon became a morning fixture, this will mark the sixth time that it has gotten together with Venus to form an eye-catching configuration. Venus has been a bright morning "star" since it emerged into view shortly after its dramatic transit across the face of the sunlate last spring, but now it's finally on its way out. Actually, Venus has slowly been getting lower in the dawn sky for the last four months. In January, this dazzling orb doesn't even rise until morning twilight is under way, and it is only about 10 degrees up in the sky — the equivalent of your clenched fist held at arm’s length — by the time it fades away in the brightening morning sky. But Venus' great brightness still renders it easily visible in the east-southeast until just before sunrise. The sooner you look for Venus this month, the better: By month's end the planet won't appear over the horizon until after mid-twilight, preceding the sun into the sky by only about 40 minutes. Although Venus is still three months from superior conjunction with the sun, the fact that it is placed well south of the celestial equator keeps it very low as seen from mid-northern latitudes. As it draws closer to the sun, Venus will drop deeper into the bright morning twilight, eventually being rendered invisible after the first week of February. Venus will begin to re-emerge very low in the west-northwest evening sky shortly after sunset during the second half of April. From then on, it will spend the rest of 2013 getting progressively higher and more prominent as an evening object. But it won't be until nearly nine months from now, on Sept. 8, that it will again have a close encounter with the moon. Editor's note: If you snap an amazing photo of Venus and the moon, or any other night sky object, that you'd like to share for a possible story or image gallery, send photos, comments and your name and location to managing editor Tariq Malik at spacephotos@space.com. Joe Rao serves as an instructor and guest lecturer at New York's Hayden Planetarium. He writes about astronomy for The New YorkTimes and other publications, and he is also an on-camera meteorologist for News 12 Westchester, New York. Astronomer Geoff Gaherty of Starry Night Education contributed to this report.